When he was ten he moved, with his father and stepmother, to Bremerton, Washington, a suburb of Seattle. He first fell in love with music when he was in elementary school. and tried nearly all the instruments in his school band before settling on the trumpet. While barely in his teens, Quincy befriended a local singer-pianist, only three years his senior. His name was Ray Charles. The two youths formed a combo, eventually landing small club and wedding gigs. At 18, the young trumpeter won a scholarship to Berklee College of Music in Boston, but dropped out abruptly when he received an offer to go on the road with bandleader Lionel Hampton. The stint with Hampton led to work as a freelance arranger. Jones settled in New York, where, throughout the 1950s, he wrote charts for Tommy Dorsey, Gene Krupa, Sarah Vaughan, Count Basie, Duke Ellington, Dinah Washington, Cannonball Adderley and his old friend Ray Charles. By 1956, Quincy Jones was performing as a trumpeter and music director with the Dizzy Gillespie band on a State Department-sponsored tour of the Middle East and South America. Shortly after his return, he recorded his first albums as a bandleader in his own right for ABC Paramount Records. In 1957, Quincy settled in Paris where he studied composition with Nadia Boulanger and Olivier Messiaen, and worked as a music director for Barclay Disques, Mercury Records’ French distributor. As musical director of Harold Arlen’s jazz musical Free and Easy, Quincy Jones took to the road again. A European tour closed in Paris in February, 1960. With musicians from the Arlen show, Jones formed his own big band, with 18 artists — plus their families — in tow. European and American concerts met enthusiastic audiences and sparkling reviews, but concert earnings could not support a band of this size and the band dissolved, leaving its leader deeply in debt. After a personal loan from Mercury Records head Irving Green helped resolve his financial difficulties, Jones went to work in New York as music director for the label. In 1964, he was named a vice-president of Mercury Records, the first African-American to hold such an executive position in a white-owned record company. In that same year, Quincy Jones turned his attention to another musical area that had long been closed to blacks — the world of film scores. At the invitation of director Sidney Lumet, he composed the music for The Pawnbroker. It was the first of his 33 major motion picture scores. Following the success of The Pawnbroker Jones left Mercury Records and moved to Los Angeles. After his score for The Slender Thread, starring Sidney Poitier, he was in constant demand as a composer. His film credits in the next five years included Walk Don’t Run, In Cold Blood, In the Heat of the Night, A Dandy in Aspic, MacKenna’s Gold, Bob and Carol and Ted and Alice, The Lost Man, Cactus Flower, and The Getaway. For television, Quincy wrote the theme music for Ironside (the first synthesizer-based TV theme song), Sanford and Son, and The Bill Cosby Show. The 1960s and ’70s were also years of social activism for Quincy Jones. He was a major supporter of Dr. Martin Luther King, Jr.’s Operation Breadbasket, an effort to promote economic development in the inner cities. After Dr. King’s death, Quincy Jones served on the board of Rev. Jesse Jackson’s People United to Save Humanity (PUSH).Jones went back into the studio to produce Michael Jackson’s first solo album Off the Wall. Eight million copies were sold, making Jackson an international superstar and Quincy Jones the most sought-after record producer in Hollywood. The pair teamed again in 1982 to make Thriller. It became the best selling album of all time, selling over 30 million copies around the globe and spawning an unprecedented six Top Ten singles, including “Billie Jean,” “Beat It” and “Wanna Be Startin’ Somethin’.” His debut as a filmmaker occurred in 1985 when he co-produced Steven Spielberg’s adaptation of Alice Walker’s The Color Purple. The film won eleven Oscar nominations and introduced Whoopi Goldberg and Oprah Winfrey to movie audiences. In 1993, Quincy Jones and David Salzman staged the concert spectacular “An American Reunion” to celebrate the inauguration of President Bill Clinton. The two impresarios decided to form a permanent partnership called Quincy Jones/David Salzman Entertainment (QDE). a co-venture with Time-Warner, Inc.The company, in which Jones serves as co-CEO and chairman, encompasses multi-media programming for current and future technologies, including theatrical motion pictures and television. QDE also publishes Vibe magazine and produced the popular NBC-TV series Fresh Prince of Bel Air. At the same time, Jones runs his own record label, Qwest Records and is chairman and CEO of Qwest Broadcasting, one of the largest minority-owned broadcasting companies in the United States. He has continued to produce hit records, including Back on the Block and Q’s Jook Joint. The all-time most nominated Grammy artist, with a total of 76 nominations and 26 awards, Quincy Jones has also received an Emmy Award, seven Oscar nominations, and the Academy of Motion Picture Arts and Sciences Jean Hersholt Humanitarian Award. His life and career were chronicled in 1990 in the critically acclaimed Warner Bros. film Listen Up: The Lives of Quincy Jones. Do you want to hire Quincy Jones? Directly request a quote. In 48 hours we can send you the availability of Quincy Jones If you would like to book Quincy Jones, Entertainment Booking Agency is the right place. 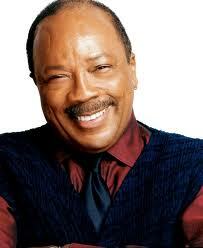 We will offer you the best price and contact the management or we directly contact Quincy Jones. For corporate appearances or speaking engagements you can contact our agents and the will help you true the process. Tags: hire Quincy Jones, Quincy Jones booking, book Quincy Jones, Quincy Jones appearances, find more information on booking Quincy Jones for appearances, Quincy Jones speaking engagements, Quincy Jones endorsements/spokesperson, Quincy Jones appearance fees, Quincy Jones booking agency contact info, biography of Quincy Jones, Contact an artist booking talent agent find a speakers bureau that can book Quincy Jones, speaker booking agency for Quincy Jones, Quincy Jones booking agency, Quincy Jones booking for corporate event. EBA is one of the biggest entertainment booking agencies in the World. We book hundreds of celebrities, artist, athletes and speakers in a year. Important to know is that we are not claiming to be the management of Quincy Jones. We are not the official agent for Quincy Jones. Companies from around the globe book these artists and speakers true our company be course we have one of the biggest networks and we always have direct contact with the artist or the management. We help you to find the right celebrities for your corporate of private events. Please contact one of our agents to get free advice and we will help to get the world-famous artist on your party.